I am pleased to announce that this coming Saturday December 15th, I will be presenting at the December meeting of the Ontario Genealogical Society Ottawa Branch (http://ogsottawa.on.ca/). My presentation will be on the subject of the Tunney's Pasture shantytown which I wrote about this past summer for the Kitchissippi Times. It will include a lot more detail and photos than I was able to squeeze into the newspaper article. I'll also speak a little to the research and genealogical challenges encountered while writing about a topic like this. My presentation is at 1:30 p.m. at the new City of Ottawa Archives building on Tallwood. It is free to attend, and open to the public. Please come out if you'd like to hear more! Kitchissippi and the first "Christmas Cheer" fund! 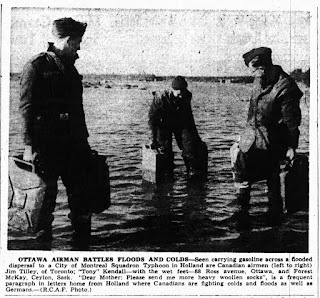 I missed adding this to the blog earlier, but my December 2018 article in the Kitchissippi Times was focused on the important turning point in Ottawa's history when an organized relief effort was first implemented to make Christmas a happier time for those less fortunate. 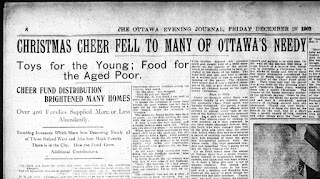 Though there had always been those in need and destitute in Ottawa, the Great Fire of 1900 led to incredible numbers of people who fell into that category. 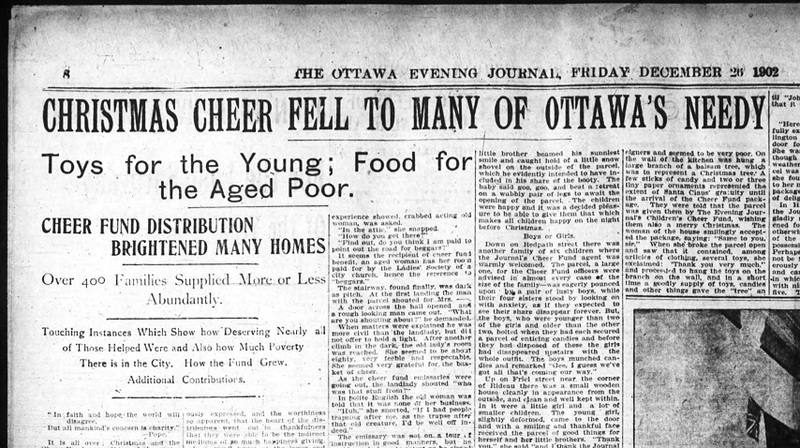 Though churches and some private organizations had made small efforts to a handful of people over time, it was in 1902 that a widespread project was kicked off by the Ottawa Journal newspaper, to maximize contributions and donations, personalize gift and food packages, coordinate volunteers and delivery mechanisms, and ensure timely delivery on Christmas Eve. It was an incredible effort, and such an important cause, which forever changed the way Ottawans cared for one another, particularly at Christmastime. 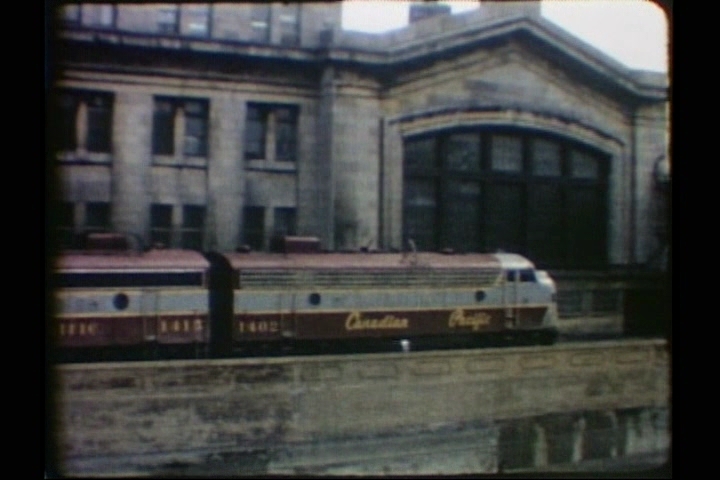 The Museum Proudly Presents: More rare 1960s Ottawa train footage! 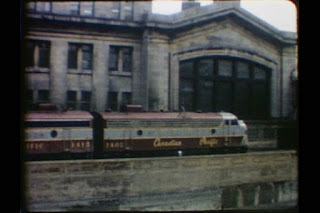 I am pleased to be able to share an exciting series of home video footage of trains in and around Ottawa during the mid-late 1960s. Other than within limited railway circles, this is the first time all of this footage is being shared publicly. My long-time neighbour on Gilchrist Avenue Bruce Chapman is one of the biggest railway aficionados in Ottawa. He worked the rails for many years, but he also had the incredible foresight to take video footage of trains throughout the 1960s. Not only this, but due to his position with CPR, he had the unique and rare opportunity to make several recordings from inside the front of a moving train as it travelled within Ottawa-Hull. 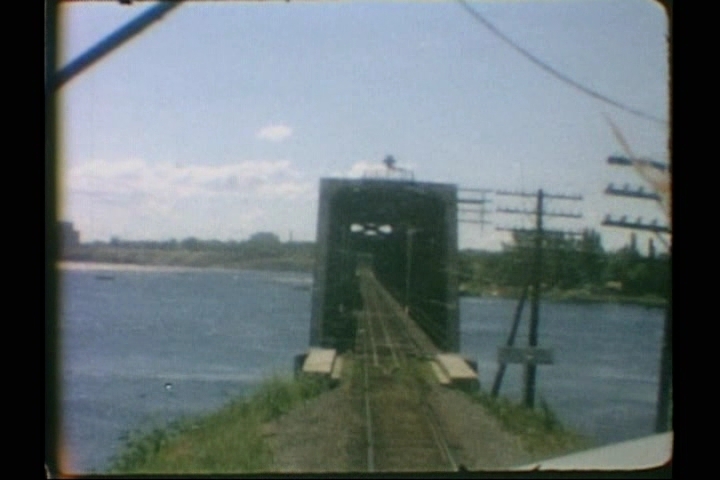 So many of these clips start or end at fabled Union Station in downtown Ottawa, and also over the bridges to Hull, at old Ottawa West station (where Bayview station and Tom Brown Arena now stand), and all along the CPR lines. I've been excited for some time to be able to share this footage, and I'm so happy Bruce has given me the green light to share it through the Kitchissippi Museum. You may recall that earlier this year I shared a selection of clips that featured Kitchissippi itself - largely around Scott Street and Ottawa West station. Well these clips in some cases do show Kitchissippi, but they are the full clips, showing the trains travelling in and out of Union Station, and around the NCR. As mentioned in the video details, there is no audio at all, the video was filmed without sound, as was common in the era. The videos range from short 1 minute clips to as long as 9-10 minutes. I wrestled with the idea of combining them all in to one YouTube video, or splitting them by date and topic, and chose the latter, as I thought it would be less confusing. It's also fairly easy to flip from one video to another. The unbelievable 1890s Hintonburg arson case! In the 1890s, Hintonburg was still a collection of almost exclusively small wood-frame houses, built by the workers at the nearby rail and mill yards. Lots were still plentiful, and available for a cost of next to nothing. Infrastructure was still a work in progress (electricity had just arrived, but no water, sewer or streetcars yet), and the small population still largely was involved in farming, gardening and poultry. With houses so primitive and no water available (other than a bucket-brigade to a well), a fire would be immediately devastating, and could wipe out a whole block, which was certainly a risk in the faster-building areas like Mechanicsville, where houses were going up practically touching each other, all in quick succession. Few people had insurance back in this era, especially amongst the working class, but if they were to have one type of insurance, it was house insurance. Everything they owned and had worked for was put into their house. Yet, house insurance was still in its infancy, and as history shows, was quite exploitable. Most of these early houses were worth only $300-$400 at the time. A house insurance policy might cost only a few dollars per year. And though house fires were very frequent owing to how homes were heated and meals were cooked, not to mention the overall quality of construction of the homes themselves, the temptation to torch your own house for the insurance settlement was surely a factor on the regular. Insurance agents in the early days were kept busy investigating the most suspicious house fires. One of the most bizarre stories I have ever come across is the tale of Thomas Lewis. There is just so much that is hard to believe in this story, yet it is all true. 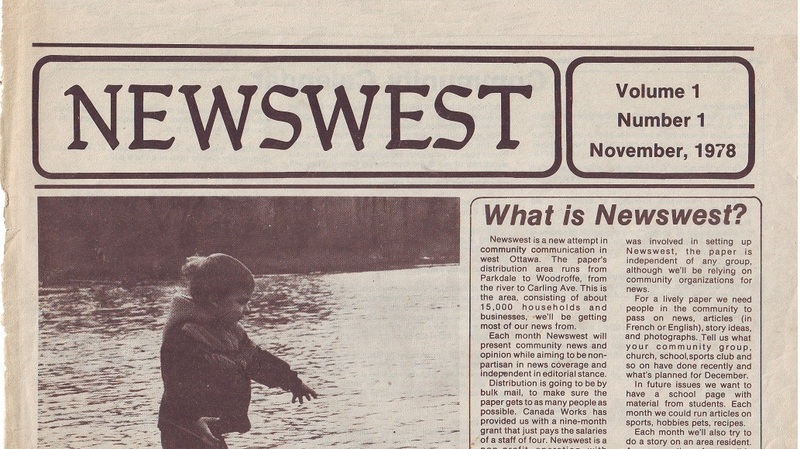 A tale right out of the wild, open days of old-west Hintonburg 1894. 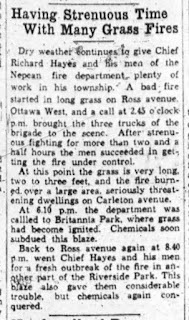 Monday October 22nd, 1894, was another ordinary day in late 19th century rural Ottawa - except for the odd coincidence that there were FOUR fires in our area that day! The McTiernan farm (located on what is now the south side of Carling, between Fisher and Merivale) lost every barn, stable and outbuilding (except the main residence) during an overnight fire. Then in Birchton (Westboro today, west of Churchill) were two house fires that overnight as well. News reports indicated that the fires were all "hazy", suggesting that perhaps "tramps" had started the fires. The fourth fire occurred in Hintonburg, on what was known as McLean Street, now better known as Fairmont Avenue. 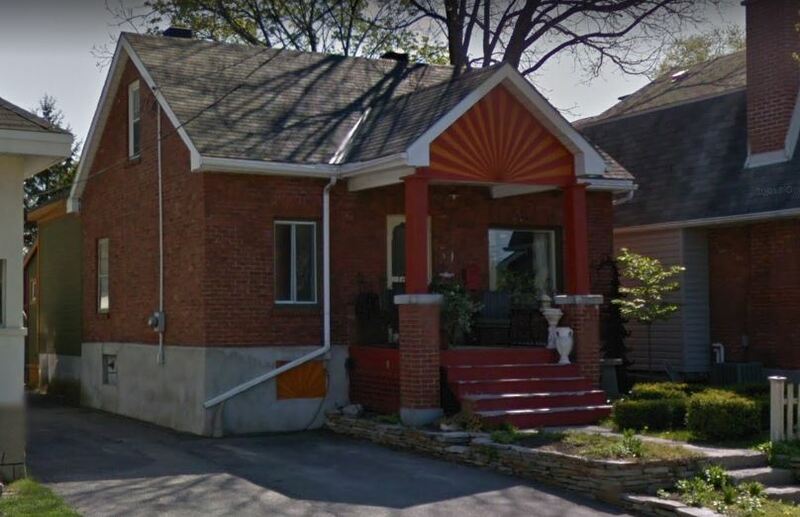 It was in a small, isolated house where today 61 Fairmont stands, but back then it was one of only a handful of houses on the street, set back in an open field that was largely open all the way to Parkdale Avenue. The fire was in the home of Thomas Lewis, a 38-year old carpenter who may have been a Carleton County Constable at the time, or at minimum was imminent to be appointed as one. This fire was noted as being shady as well, since this was the third house fire in two years to have victimized Lewis (his previous house had burned down that April, and was originally attributed to children playing with matches). Following the fire, Thomas Lewis moved elsewhere in Hintonburg, and would begin a 3-year stint as Carleton County Constable, which would have him overseeing the law throughout the County. But as you might see in an 1890s-set movie, though Lewis worked on the right side of the law, he frequently found himself on the wrong site of it. One of the most notable stories of several that 120+ year old newspapers reveal, is the Celia Kernan case. 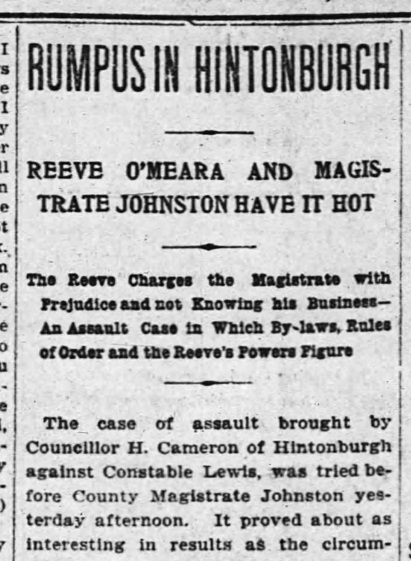 In July of 1895, Lewis was charged with the "indecent assault" of Celia, who was a former Hintonburg resident now living downtown on Kent Street. Celia claimed that Thomas came to her house, and after a brief conversation about a business matter, made an "improper proposal", which she refused, resulting in Lewis responding with a more physical attempt. A witness added in court that before entering her house, Lewis had given Celia's son 5 cents and sent him and a boarder out to the store to buy candies. When the boarder returned, he heard Celia scream, ran inside and found Lewis in a "compromising position", from which he ran off. Lewis' version meanwhile was that he was visiting Kernan along with another Constable to collect back taxes from when Celia lived in Hintonburg, and claims her story is blackmail over her debt. Interestingly, on the same day the matter was heard at court, Celia was a defendant in another matter, of "allowing noise in her house" from her Hintonburg days. But making things even more interesting, on the day of the trial, Celia was a no-show at court. Why? Because she had been arrested in Hintonburg the night before the trials for disorderly conduct - by Lewis! Meanwhile, Hintonburg Reeve O'Meara (and obviously an enemy of Lewis's) paid Celia's bail, and said he would help ensure that her charge against Lewis be seen through. To help with that, later that day O'Meara had Lewis arrested, under the charge of "extorting money from a pedlar". Eventually, Celia was found guilty of her "disorderly conduct" charge and fined $25 plus $15 in costs (this was a significant sum of money), while Lewis was also found guilty for his assault. He unsuccessfully appealed that charge, and even went so far in 1896 to take the judge (Judge Harvey) to court claiming damages for "malicious prosecution and false arrest". But in February of 1896, Lewis was back in trouble. His fellow Constable, Constable Thompson, charged that Lewis had made an illegal seizure of property belonging to Mrs. Charles Mariaville. Thompson believed Lewis had no search warrant, and thus no authority to make the seizure. But get this, the judge to hear the case was the same for whom Lewis was currently taking to court on the malicious prosecution charge, Judge Harvey! His lawyer wrote up a sensational notice Judge Harvey, claiming that the alleged offence was only a civic trespass, not a crime, and thus the Judge had no jurisdiction; that the Judge had a conflict of interest in the case because of the pending action from the other case; accused the Judge of not being "a native of Canada" (which apparently meant that he could not be a county judge); and went so far as to further question the Judge's qualifications beyond his nativity, threatening further lawsuits if the Judge heard his case with Thompson! Meanwhile, as all of this was going on, Lewis found himself in yet further action, as at the Hintonburg council meeting on February 7th, Hintonburg Councillor H. G. Cameron attempted to read a petition signed by several Hintonburg residents demanding an investigation into alleged illegal actions on the part of Reeve John O'Meara. O'Meara objected and ordered Lewis to remove Cameron if he continued to read the petition. According to the paper, "Lewis requested Councillor Cameron to desist reading the motion, laying his hand on his shoulder at the same time." Cameron continued to read the petition, leading O'Meara to announce the meeting was to be adjourned, seconded by another Councillor, and everyone left the hall, "leaving Councillor Cameron reading his petition to an empty room." Following the meeting, Cameron then issued a summons against Lewis for assault, and the case was heard on the 13th (court cases moved very quickly back in this era). 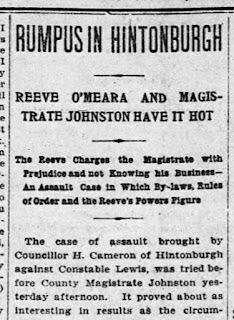 The newspaper account of this hearing came with the hilarious headline of "Rumpus in Hintonburgh", and detailed how the Reeve (who was also a lawyer) defended Lewis in the case against Cameron. The trial included O'Meara requesting an adjournment of a few days to find more witnesses, to which Judge Johnston refused, stating the the case was pretty clear for the prosecution, and that if O'Meara were to call any witnesses that they would be "trumped up". O'Meara lashed out at the judge, accusing him of having already made up his mind against the defendant (Lewis), and officially requested a new trial, with a new judge, and after more arguing, eventually threatened that if the judge continued with the case, he would take it to the attorney general and have him disqualified as a magistrate. O'Meara got his wish with an adjournment of three days. Hilariously, next up on the docket on the 13th was the case of Constable Thompson against Lewis, on the charge of trespassing on Mrs. Mariaville's property without warrant. The newspaper only included one line about this charge, noting that (somehow) it was discharged (how the judge possibly could have heard the case with an open mind after the first half of the morning, and even after all that sided with Lewis is incredible!). Continuing the endless string of litigation, in response to Cameron's assault charge, and the fireworks at the first day of the trial, Lewis filed a counter action against Cameron, for his "creating a disturbance" at that same council meeting. Unfortunately, the whole Cameron-Lewis-Judge Harvey drama did not proceed any further. 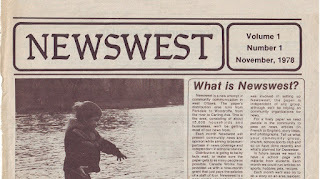 The newspaper the following week simply noted that the situation had been settled out of court. But was it actually settled? Did Lewis have other enemies in Hintonburg? Surely he did, if the above tidbits are any proof. Lewis spent most of 1897 living away from Hintonburg, and there was little on him in the media... that is, until January of 1898. In January of 1898, Lewis submitted what were discovered to be "fake" news items to the Ottawa Journal, "one of the items was calculated to cast a slur on a member of Bethany Presbyterian Church, and the other a slur on the Anglican church in the village (Hintonburg)". When the reporter investigated the story in Hintonburg, he heard from several people in the village that "Constable Lewis was not a desirable man to be an officer of justice. One assertion was that there was reason to believe he had burned his house to secure the insurance". The Journal, based on Lewis's important job as county constable, and the seriousness of the charge, decided to investigate further, and interviewed individuals who had been recommended as having information, including the head of the Capuchin Monks monastery (now St. Francois D'Assise Church), and the agents of the Phoenix of Hartford insurance company. Some of the tidbits of info were noteworthy. Lewis had added insurance to his house only on Oct 4th, the fire being 18 days later on Oct 22nd. Lewis was paid out $325 in the insurance settlement, and owed D.H. MacLean several hundred dollars (MacLean being the agent who collected money for the estate from which Lewis bought the property on an installment plan). After Lewis received the $325, he did not pay the estate anything, and simply let the property lapse. Meanwhile, a person Lewis attempted to obtain coal oil from stated that Lewis asked for it stating he was bothered for want of money and intended to burn his house. At the time the request was treated as a joke, but when finally Lewis did get his hands on some oil, within hours his house had burned. The Journal took their info to the County Crown Attorney, who put the file into the hands of High County Chief Bliss for official investigation, resulting in the charge of arson. On the evening of Thursday February 17th, while still holding the title of County Constable, Lewis was arrested and taken to county jail on the charge of setting fire to his own house way back in October of 1894. The paper noted that the arrest was done quietly; as quietly as the evidence gathering that Bliss had been conducting over the previous few weeks. The newspaper noted that "the evidence is said to be very strong against him". The papers though oddly failed to point out how bizarre it was that the charge came nearly three-and-a-half years after the fire took place. Lewis at the time of arrest said he was innocent and had witnesses to prove his innocence. The court trial would captivate Hintonburg, and contained a lot of shocking testimony. 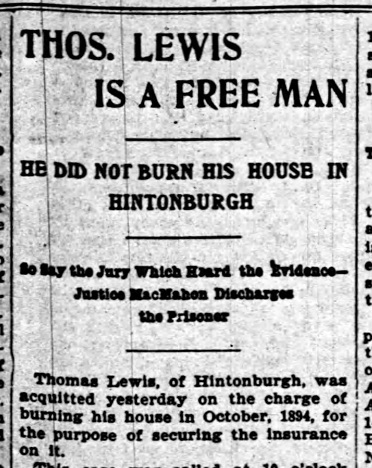 Lewis had freshly stepped down from his role as Constable (I assume, for reasons unrelated to the arson accusation) when the County Judge heard arguments on March 4th 1898, about whether the case should go to trial. 15 witnesses were called altogether, and the story was pieced together. Benjamin Foster who resided on Parkdale just south of Wellington, and Mrs. Eliza Stimson who lived on what is now Sherbrooke) were the two key witnesses for the prosecution. Foster stated that he heard the fire alarm go out as he was having lunch that day. He went over and aided the Capuchin Fathers in putting it out. He returned home, but an hour later saw the house on fire again. He went over and again aided in putting it out, the fire burning on the roof near the chimney where it had the first time. At that time he claimed he asked Lewis if the house was insured, and Lewis pulled the policy out of his pocket and showed it to him, stating it was insured for $500. Most of Lewis's furniture and possessions were out on the grass in front, and so his neighbour Mrs. Stimson suggested putting them back inside. Stimson and Foster began doing so. As they did, Foster claimed he saw Lewis make wood shavings with a knife, and then take the shavings and some paper to the basement. Mrs. Stimson, sensing what he was up to warned him "take care, it is a penitentiary job" (meaning, be careful, as he would go to jail for burning his own house down intentionally), to which Lewis responded "By God, it must go." Foster claimed that he then left, and went walking down Richmond Road. After a short distance, he looked back and could see flames coming through the cracks along the bottom part of the house. Seconds later, Lewis came running down Richmond to catch up to him, and asked him to go have a drink, so they went to Byers Hotel (just before Merton). While there, the house burned down. Foster also claimed he could smell coal oil on the floor boards the second time they put the fire out. Mrs. Stimson also claimed that Lewis complained vocally about the priests who had put out the first two fires, that if it hadn't been for them, the house would have burned. She also claimed he told her that the house had to go, for his landlord MacLean was after him for his installment money. She told him "You shouldn't do it, Tom. You will be found out and will have to go to the penitentiary". But he didn't care. When cross-examined, she stated that she didn't say anything about the arson afterwards because she did not consider it any of her business. Father Moise, Father Patrick and Brother Thomas of the Capuchin monastery swore they assistaed in extinguishing the first two fires, but the third time they did not bother. Mrs. Byers testified that she had been asked by Lewis for coal oil on the day of the fire, but refused him. Instead he took an empty gin bottle to St. Matthias church (where he was the janitor), and where he knew there would be plenty of oil. She claimed that Lewis went inside with the bottle, came out without it, went around the side of the building, and then moments later saw him going towards his house with the bottle in his hands. Lewis and his lawyer did not have any witnesses for the defence, and the Judge ordered that the case me moved to trial in April. 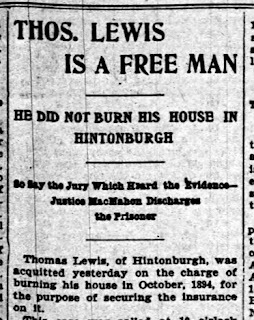 Lewis's trial was held on Wednesday April 20th, and it was a marathon, running all day from 10 a.m. until the verdict was reached at 9 p.m.
James Byers, owner of the Hintonburg hotel and tavern (who will be the subject of a very exciting upcoming Kitchissippi Times article, by the way! ), added to the original testimony, stating that the morning of the fires, Lewis had assisted him in taking a pump out of the well. Byers stated that after removing the pump, he took Lewis to his cellar and gave him an armful of vegetables. Lewis threw them down saying "I don't think I'll take them, Jim. I owe MacLean $200 and he is pushing me for it. By God, I am going to burn the house and get the insurance." When Byers saw Lewis in his bar later that day, he accused him of burning his house, and Lewis did not reply. Lewis's lawyer made an aggressive cross-examination of key witness Benjamin Foster, during which the Citizen reported he "alternated from scolding to appeals of "Now, Benjamin, tell the truth"", though Foster never wavered. Lewis's lawyer was attempting to prove that Foster was testifying against Lewis out of spite. Most of the details were largely repeated from the first hearing, though this time the defense presented some evidence and witnesses to attempt to help his cause. Local merchant William Joynt testified that Lewis and Foster had a dispute within Conservative party circles shortly before the charges against Lewis were made, over the appointment of a chairman within the local committee. Lewis claimed that he threatened to vote Reform if he did not get the chairman he wanted, at which time Foster allegedly stated "We'll fix you for that, Lewis". Mrs. Latimer was a witness for the defence, who was apparently present with the Lewis's, Foster and Stimson, and denied that Lewis had cut shavings, or went into the basement, and that neither Foster nor Stimson warned Lewis about setting fire to his house. Much to the surprise of all in the courtroom, Lewis took the stand in his own defence, and claimed he never said anything to anyone about setting his house on fire. He also denied that MacLean was pressing him for money. He stated he had been to the church for coal oil, needing it "to grease some rusty hinges", but did not get any at the church nor at Byers. 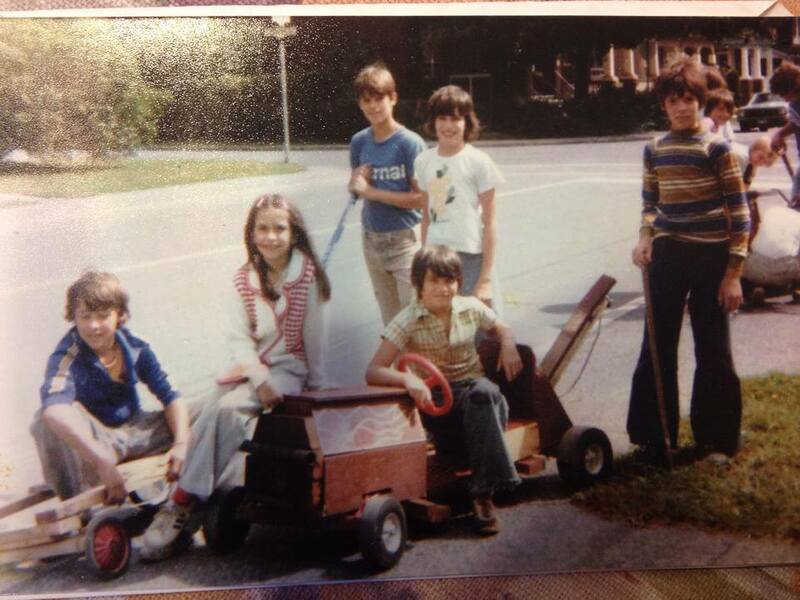 He claimed the Byers' had been "bad friends" with him ever since he had convicted the Byers for selling liquor to a minor. He also claimed that after the second fire was out, he left with Foster (who drew water for the village - remember this was the period before water service was available in Hintonburg, so water had to be acquired and kept for emergencies), to go secure barrels for water for his house, having used all the water in his well on the first fires. What appeared to be a slam-dunk for the prosecution somehow didn't work out that way. The jury came back at 9 p.m. that evening and 2-3 hours deliberation, and returned a verdict of not guilty, and Lewis was discharged! Crazy shenanigans in a crazy era. I'm just thankful that newspaper records exist that can allow the story to be brought back to life 120 years later. My article in October's Kitchissippi Times was an in-depth history of an important Westboro structure, the McKellar-Bingham House. It's a beautiful old house that has been re-purposed a couple of times, and notably has been divided up now into individual condos. 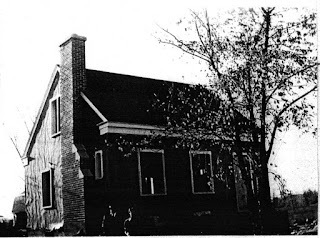 It has thankfully been saved from the wrecking ball on a couple of occasions, and provides a great link to the past, when Westboro and McKellar Park were farmland, and Richmond Road was a farmer's road. 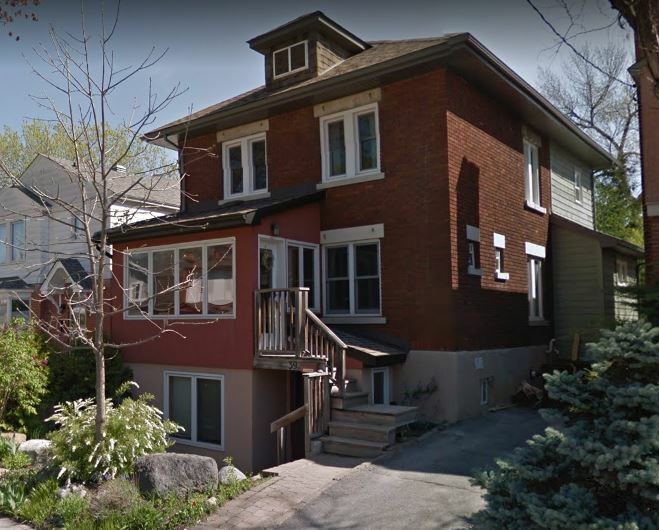 I also was happy to finally profile this house to help clear up the occasional confusion people have between it and Maplelawn, a similar-looking house also build by the Thomson family a little to the east on Richmond. Name meaning: The street is named for long-time Carleton County Judge William Aird Ross (1815-1904), who was also a long-time resident of Hintonburg. Judge Ross was born in Ardross, Ross-Shire, Scotland, and came to Canada after completing his schooling. He became a school-teacher and became Head-Master at grammar schools at Williamstown, L'Orignal, and Dalhousie District (later to become Lisgar Collegiate). After 6 years at Dalhousie District G.S., he resigned in 1856 to study law (he completed a B.A. from Queen's University in 1855 while concurrently teaching). He was called to the bar of Upper Canada in 1859, and of Quebec in 1868. In Ottawa, he practiced law with the future Secretary of State, the Hon. R. W. Scott, K.C. On September 22nd, 1874, he was appointed Judge of the County Court of Carleton and of the City of Ottawa, succeeding Judge Armstrong (who constructed the heritage 'Richmond Lodge' on Armstrong Street in Hintonburg). He filled this position for 23 years, retiring in December of 1897. Judge Ross lived nearly 40 years in Hintonburg, on property he acquired and built on back in 1865. 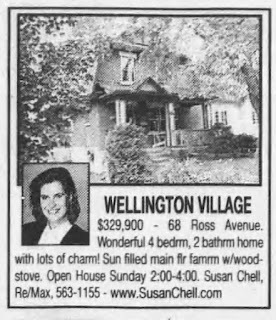 It was a stately 2.5 storey brick home, set well back from Wellington, almost at Connaught School, behind what is today the Grace Manor. After he passed away, his family sold the 8-acre lot to the Salvation Army. The old Ross house became the "Salvation Army Home for Children" until 1930, at which time it became the Nurse's Residence. It stood well into the 1960s when it was demolished as part of the Grace Hospital's expansion, and their requirement for a larger parking lot. 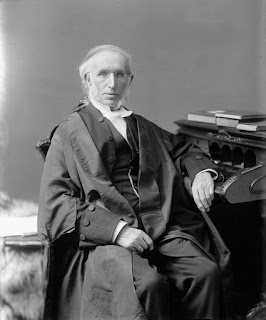 Upon Judge Ross's passing, the Carleton Law association stated: "The association desires to place on record the high regard in which the late judge was held by the bar of Ottawa. During the many years in which he presided over the county and local courts he was known as an able lawyer and a painstaking and conscientious judge and was particularly esteemed or his uniform kindness and courtesy to the profession. Cherishing the memory of the late judge, as we do, for these qualities, we appreciate the great loss which his family has sustained by his death." 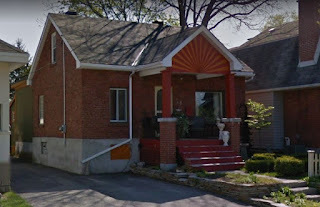 How named: Ross Avenue was first established on paper as "First Avenue" in the 1874 subdivision called 'McLeansville' which was created by real estate speculator Hector McLean. 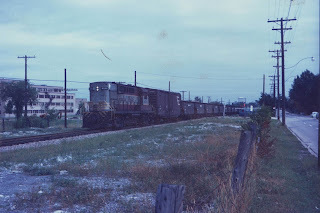 (This was for the same segment that exists today, Ross between Wellington and Scott.) No lots fronting First Avenue ever sold, and McLeansville died off as an unsuccessful venture in late 1876. In 1892, Alex Stewart re-registered the McLeansville plan as his own, and renamed a few of the streets, including First Avenue. As Judge Ross was one of the most respected residents of the neighbourhood (and of all Carleton County), it is no surprise that Stewart elected to name the street for him. 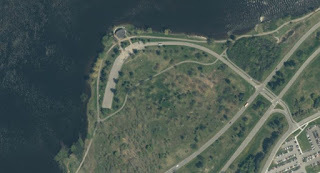 However, for perhaps as long as fourty or fifty years, Ross Avenue did actually exist as just a thin early dirt pathway that ran from Richmond Road to the Ottawa River. Evidence of this can be seen in the aerial photograph from 1920, before any houses were built on Ross Avenue. from Wellington north to the River in the centre of the photo. As you can see, there were actually structures at the corner of Ross and Wellington. This is because this corner was the site of the earliest development within Wellington Village. 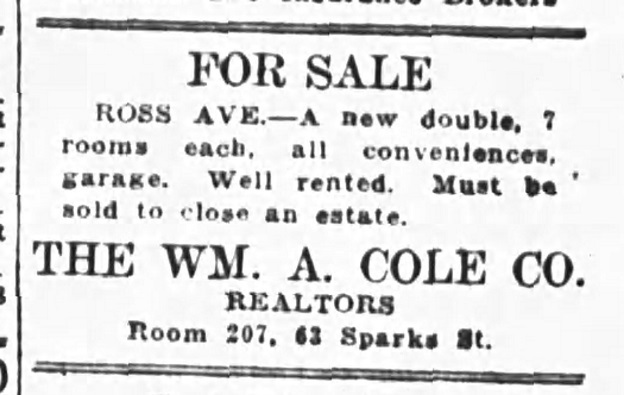 While McLeansville was almost a total crash for Hector McLean, he did manage to sell a handful of lots, including the two lots at the corner of First Avenue (aka Ross). These were Richmond Road lots 14 and 6. Lot 6 was sold in 1874 even before the McLeansville plan was officially registered in 1875. Thomas Knott, a 37-year old stone mason acquired the lot for he and his wife, and built a 2-storey wood house (later bricked) fronting onto Richmond Road. He remained here until selling in 1892, but impressively the house stood all the way until 1955, when it was torn down for the commercial building that replaced it (now Capital City Luggage). Stables existed at the rear of the lot, and in 1920 a portion of the lot to the west was split off an a small shop was built (the 1920 aerial photo above appears to show the shop under construction). This shop was the long-time location of the Victoria Fruit Market, operated by the Progosh family, and later Superior Cleaners & Dyers. Meanwhile on the east corner (now Supply and Demand, formerly the CIBC) was an old 2-storey wood house that was built around 1875 by Jeremiah Driscoll for his wife and two children. Driscoll was a 49-year old farm labourer. It later became the long-time home of Thomas Dietz and his family (1903-1944). It too was torn down to make way for development, lasting all the way until 1854.
houses at the top of Ross Avenue at Wellington. The first house to be built fronting on to Ross Avenue is a bit grey. It appears the first two houses built on Ross were small shacks that were only around briefly. 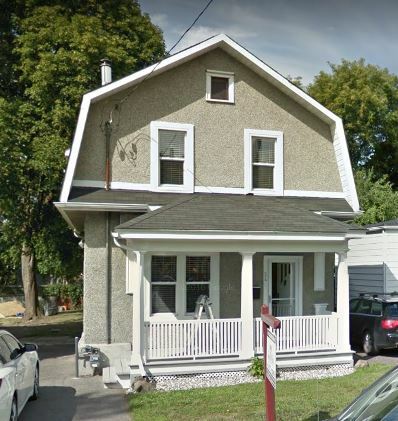 The Ottawa City Directory for 1921 indicates one single house on Ross Avenue, occupied by John D. Morris, a sheet metal worker, who operated a small sheet metal shop at 361 Somerset Street West. 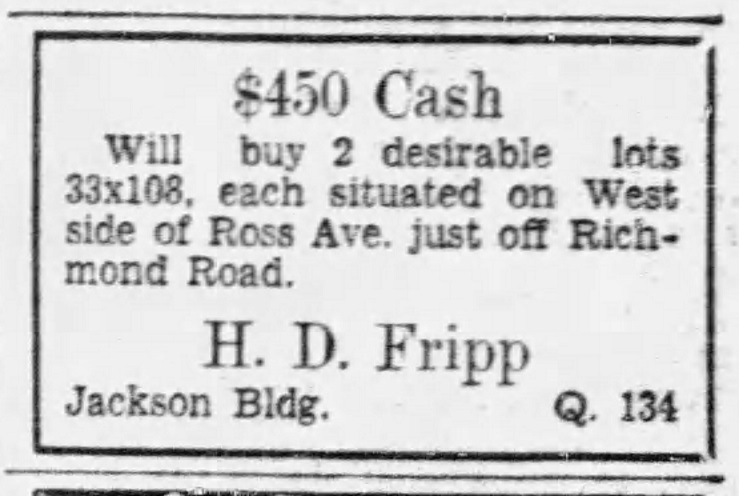 While the Directory was not always 100% accurate with its data, the listing is solidified by the fact that Morris was one of the lot buyers at the May 1920 auction. On that day, he purchased lots 820 and 821 for a total of $300 (now the sites of 52 and 50 Ross, respectively). However, in 1922, there is no record of a house on either lot, and Morris is listed as living elsewhere. Registry records show Morris sold the two lots for $700 in 1923 (a fair price considering the initial uptick in land value between 1920-1923), and had never taken out a mortgage on the property to build. There are also no stories of any house fires happening on Ross around that time that would also explain it. The 1921 Census further confirms the existence of the shack, listing Morris as one of the first handful of residents in Wellington Village north of Wellington. He is listed as residing with his wife Anna in a 1-room house on Ross. Aerial photos from 1927 and 1928 appear to confirm the existence of a tiny house set at the very back of lot 820 (52 Ross), along the rear lot line. It must have been a primitive shack, and even the Census lists simply an "X" in place of his earnings, indicating he made very little. It appears Morris only resided in it briefly, and then moved out (perhaps not even by choice; recall the OLA had put in very specific building conditions to ensure a higher-class neighbourhood), and the shack stood for 6-7 more years, seemingly without any occupants until removed in 1928 when 52 Ross was built. Tragically, Morris died in his shop in May of 1925 when the gasoline tank of a car exploded while he was using a blow torch. 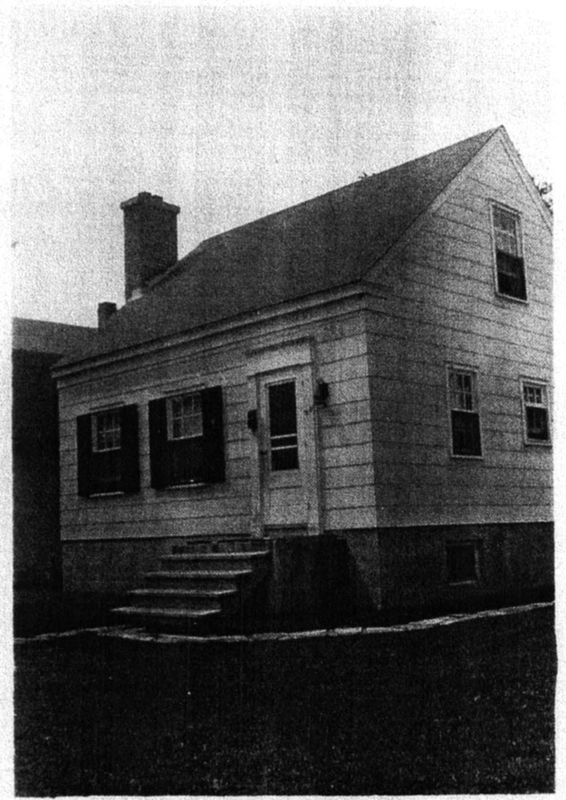 A second shack house was built in 1921, by Albert H. and Gertrude V. Bodley on their lot (now 59 Ross). It was a small, 2-room wood house. They were 33 and 31 year old respectively, and had two small children, 2-year old son Eric and 1-year old daughter Dorothy. Albert was employed as a bookkeeper with the RCMP. Their small house was a temporary one, until they could obtain permission and funding for their larger house. 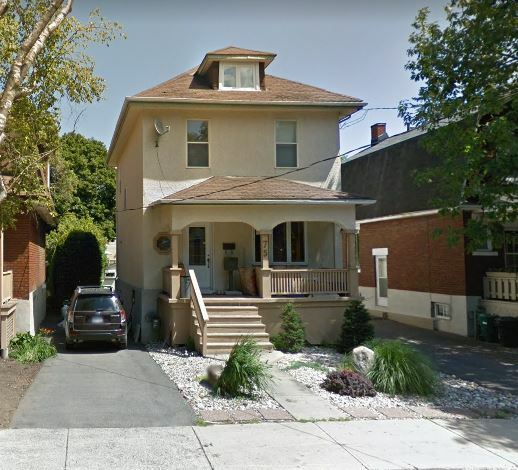 They did indeed obtain a permit in October 1921 and a mortgage for $2,000 in December 1921 to construct 59 Ross Avenue. 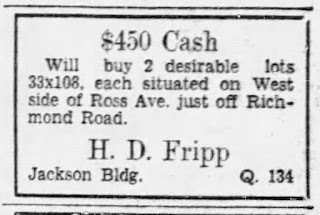 Sadly, their story on Ross Avenue did not have a great ending, as they lost the house due to foreclosure in 1927. In 1921, the first four 'permanent' houses were built on Ross Avenue. It is difficult to determine which of the four was started/finished first. Certainly the permanent Bodley house above at 59 Ross is in contention. The likeliest title-holder of the "first" and therefore oldest house on Ross Avenue is 44 Ross. And it would have been built even earlier if the original lot owner had his way. James A. Foley was an employee with the CPR his entire life (almost literally, he started with them at the age of 13, and worked 38 years until his death at age 51). He married his wife Honorah when he was just 18 in 1912. The couple had applied to the city for a building permit in March of 1921, but was turned down since no water mains or sewers had been installed on Ross yet, and there would have been an obligation for the Board of Control to commit to install them with the issuance of a permit. Therefore, the Foleys did not succeed in obtaining their permit until October of 1921. The Foley's financed the construction of 44 Ross with a loan from the Home Building and Savings Association. Across the street at 39 Ross was a house built by James Foley's younger brother Russell R. Foley and his wife Beatrice. Russell acquired the lot in October of 1921 for $210 from the original auction purchaser, and immediately constructed the house. Russell was employed with the Post Office Department's equipment and supply branch. Sadly the Russell's would lose their 7-year son Edwin Russell to a heart condition in 1927, and records indicate they moved out soon after, renting to tenants for two years before selling to the Clarkins, who would remain in the house for over 40 years. The fourth house built in 1921 is 24 Ross, which was built by Felix and Hermantinne Leblanc during the winter of 1921-1922. Felix acquired the lot in August of 1921 for $185 from the auction purchaser. He was 43 years old, and employed as a plastering contractor, a job he did in Ottawa for 60 years. Sadly the Leblancs also experienced a family tragedy similar to the Foleys, when their 7-year old son Joseph died in 1927 when hit by a car at the top of the street (full story below). Joseph was one of nine siblings the Leblancs raised in the house until 1941. Two houses were added in 1922: 79 Ross built by Thomas Cantrill, and 51 Ross by William J. Slade. Throughout the 1920s, Ross Avenue would continue to grow by a handful of houses per year. There were a total of 20 by late summer of 1926. 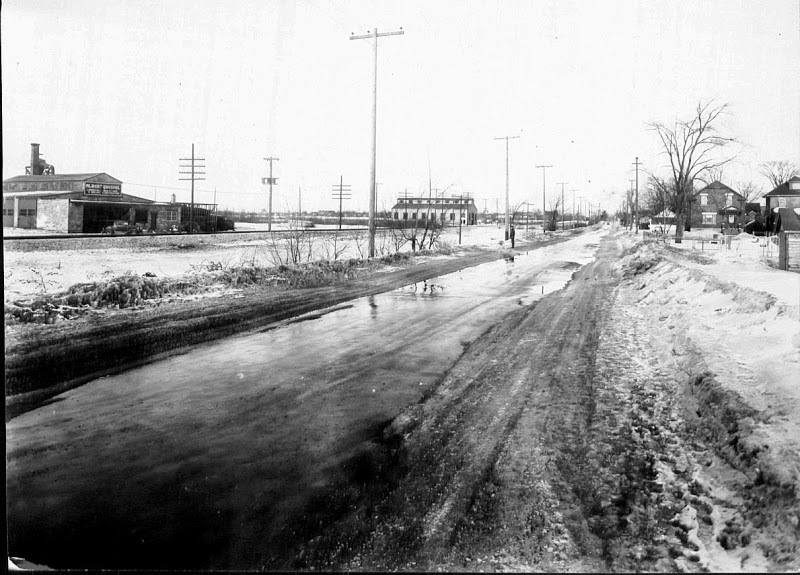 In November of 1900, water mains were extended down Richmond Road from Holland Avenue to as far west as Ross Avenue. It was anticipated that development in the area would occur soon (it would be delayed 19 years). Water service within Hintonburg was still a novelty, as the pumphouse had opened just twelve months earlier. In March of 1908, Rosemount Avenue was then known as Tenth Avenue, but as Hintonburg had been annexed to the City of Ottawa, all numbered streets had to be renamed. City staff had selected the name "Clarendon Avenue" for it, however the Methodist Church which stood on the street preferred the name "Ruskin Avenue". And yet the residents of the street petitioned to call it Ross Avenue, after Judge Ross who had passed away just four years prior, and whose homestead was just in behind the street. In the end, Rosemount was selected, and Ross remained the name of the still-named Ross Avenue. In November of 1921, the City began work on installing a 9" clay tile pipe sewer under Ross Avenue from Spencer to Scott. The cost was $3,589.45, of which the City paid $261, and the rest was paid by the property owners on Ross, at $3.262 per foot of frontage, paid in 20 annual installments. A month later the City announced plans to install water mains on all streets between Western and Holland from Spencer to Scott, for a total of $42,325. 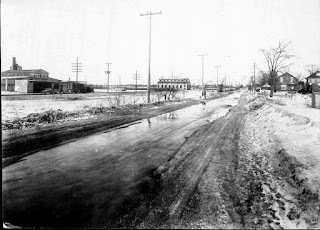 The first sidewalks on Ross were installed in the summer of 1923, when a sidewalk was added on the east side from Wellington to Spencer, and on the west side from Spencer to Scott. A year later, the sidewalks on the opposite sides of the street were added. The first tragedy to occur to Ross Avenue was in September of 1927, when 7-year old Joseph Leblanc, one of nine children to Felix and Hermantinne Leblanc of 24 Ross, was killed when darting across the road at Wellington and Clarendon. He had just been given five cents to buy popcorn from a vendor on Wellington just east of Clarendon. Joseph and his older brother Arthur waited for an opportunity to cross (this was well before lights were installed), but sadly Joseph chose the wrong time to cross. A slower-moving horse and wagon were coming west so Joseph ran out in front of them, not noticing the car heading east from the other direction. This was one of a growing number of deaths by car that were happening in Ottawa (and most bigger cities), which would soon necessitate the addition of traffic control measures as the quantity (and speed) of cars was on the rise. 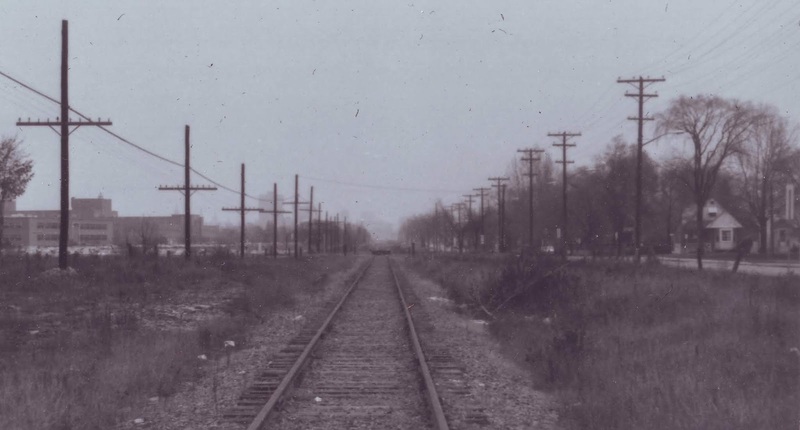 In the 1920s, Ross Avenue was one of 14 crossings of the CPR rail line between Britannia and Parkdale Avenue. 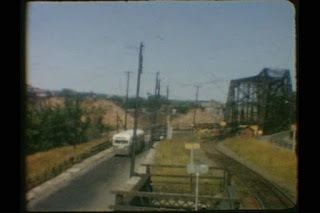 The CPR rail line ran where the Transitway runs today, and had been running there since the Canada Central Railway ran its first train there in 1870. However there was a a push in 1929 (which dragged on into 1933) to close or move several of them, including Ross, to minimize the growing number of accidents, or to eliminate overpasses located close together. However, it was conversely argued that crossings were needed for both convenience, and for more immediate access for emergency vehicles. The Board of Railway Commissioners pushed for the Ross Avenue crossing to be closed, or at minimum moved to Smirle Avenue, to create distance between the next-nearest crossing at Carleton Avenue (the next one east was at Parkdale). Residents argued that since Ross was the only street running to the river, it would expensive to then create another road at Smirle, particularly as it was largely marshland in the area of Smirle north of Scott. It was decided to be simply easiest to leave it alone, and not close or move Ross crossing. As a result, there is still a crossing at Ross today, as most (maybe all) crossings were retained when the CPR line was replaced with the transitway in the 1980 (the new overpass at Ross opened in September of 1984). Below are two of the earliest aerial photographs of Wellington Village, taken at a low altitude and high resolution, which captures in time the build-up of Ross Avenue, the greenery, etc. There is a photograph from 1928 and 1933. I've included a little more to the north of Scott in the 1928 shot to show the emptiness of the Tunney's Pasture land in that area. 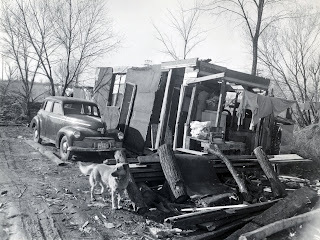 By 1930, the depression had hit, and home construction in Ottawa was virtually at a standstill. As can be seen in the aerial photo above, Ross Avenue was sparsely built up north of Spencer (as were most of the streets in Wellington Village), and lots were so plentiful in the area, and all the way west to Woodroffe, that they held practically no value. In fact, just paying the taxes on the vacant lots became too much of a burden on most property owners. And with money scarce for most, the luxury of owning a lot to build on or sell at some indefinite date in the future became too much for many to afford. Thus, many lots were surrendered to the City for unpaid taxes in the mid to late 1930s. And these weren't large sums of money. Typically the taxes owing on a surrendered lot were between $50 and $100. For lots which now would sell for half a million. In 1938, Albert Vincent Jr., one of the original auction purchasers, owed only $22.58 on his lot (now the site of 14 Ross Avenue), a lot he had invested $160 for in 1920 and held on to for 18 years, but surrendered it. Joseph Vincent (no relation), who had built and was residing at 2 Ross Avenue next door, purchased the lot, built 14 Ross between 1943 and 1946, and rented out his original house at 2 Ross. The most northernmost end of Ross Avenue extension to the River was known as "Ross's Point", a popular local swimming spot. It was known for its fast-moving currents, between the shore and the log boom that was approximately 100 yards out from shore. Around this location was also an old rock quarry at the end of Ross, which was also a popular local swimming hole. It has been filled over now, and is about where the lookout and parking area exists behind Tunney's, about where the weird circular pumping station stands. During the 1930s, brush fires were very common in the area. 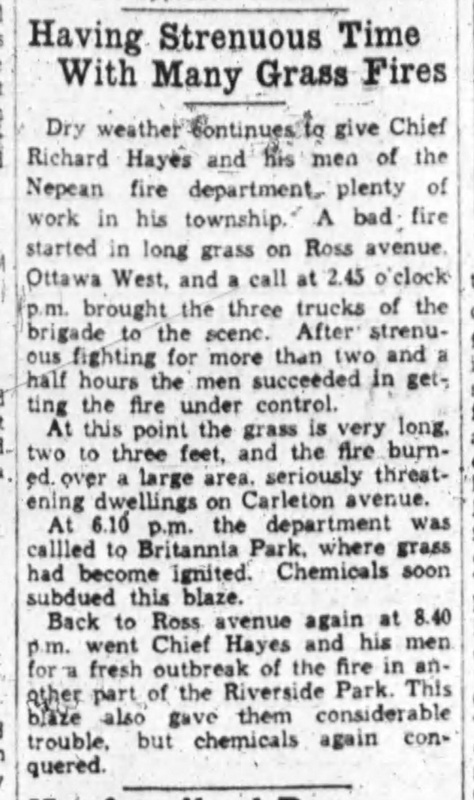 The newspapers were filled with reports of small fires occurring throughout the Tunney's Pasture and Scott Street area, before any construction began arriving in the area. The fires usually started on the hottest days of the summer, and Nepean Township and Ottawa fire crews were often visiting the area to put them out. Like most of the streets in Wellington Village, Ross Avenue had two clear eras of house construction: the 1920s and mid-1940s. Almost every house in the area was built during these two periods. From 1929 to 1943, there was very little construction happening due to the depression, WWII, lack of materials, etc. But the post WWII boom saw every vacant lot sold and houses built almost immediately. By 1946, all but one or two lots had been built on. In 1953, Ross Avenue was named one of 65 Ottawa streets that were deemed to be having traffic issues due to being too narrow (less than 21 feet wide) and thus had parking removed on one side to improve flow of the growing amount of traffic. 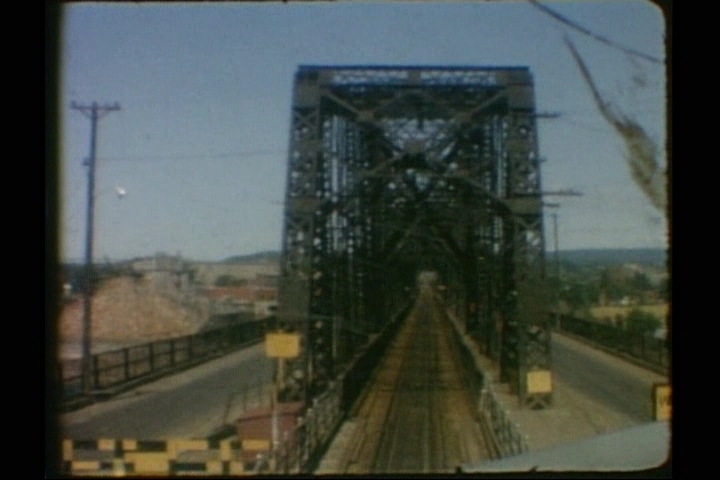 Parking was removed on the west side from Wellington to Spencer at the end of December 1953. 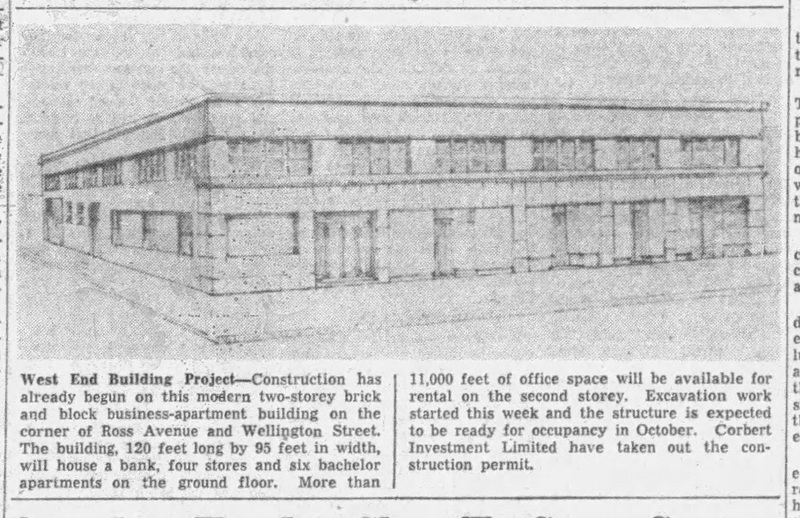 In May of 1956, likely in response to the new businesses at the top of the street and the inevitable logistics issues they created, City Council approved thirty-minute maximum parking on Ross Avenue. For many years it was one of only two streets in all of Ottawa to have thirty-minute parking (the other location being on Besserer Street in front of the post office). Ross reverted back to one hour parking in February of 1962. 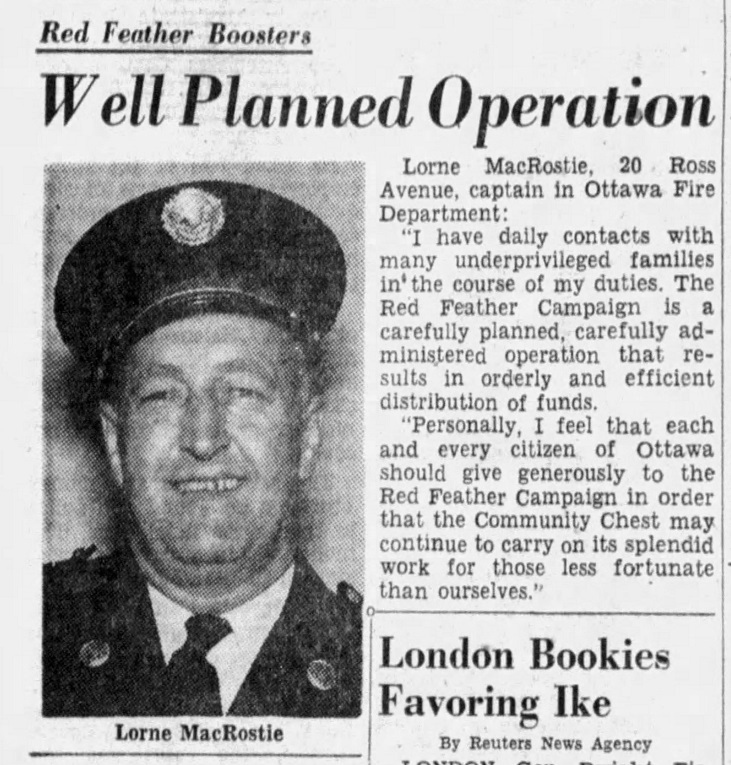 In 1963, the City called for tenders to officially extend Ross Avenue and formally establish an entrance to Tunney's Pasture at Ross, with a 28-foot wide road 645 feet in length (the Ross extension was extended an extra 1,296 feet to the north in 1966). This came at the same time the NCC was planning on removing all the old CPR rail tracks starting at Ross and headed to the west as part of their "railway relocation program" (which they did in late 1970). The track was kept in place to the east of Ross Avenue until the mid-1980s because Beach Foundry was still using the track, and they required the track back to Ross in order to pull out and back up in order to go east. Traffic issues with the Tunney's Pasture exit/entrance at Ross have always been prevalent, and continue today. Due to the crossing, the amount of traffic on Ross grew throughout the 1970s. In August of 1977, the Board of Control heard a proposal to construct a triangular island on Ross at Scott. This island would permit right turns in and out of Ross from Scott, but not allow straight through traffic. This was proposed for a one year trial. I am not sure if approval was given for this trial, but certainly if the island ever did appear on Ross, it was short-lived. Unfortunately so, as residents of Ross Avenue continue to battle today to fight Tunney's traffic on the street. Both world wars of course had a tremendous affect on every neighbourhood, and every street in Kitchissippi. Ross Avenue was no different. Several of the boys on Ross Avenue went off to the war in various capacities. The most tragic story amongst these brave kids is surely that of Charles Cantrill. 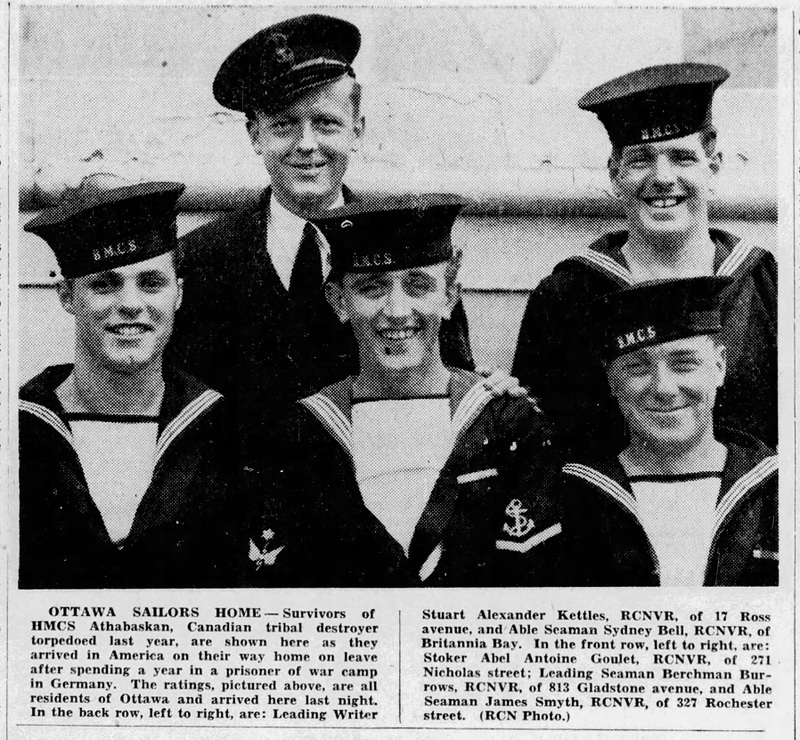 It was quite common for the local papers to profile young Ottawans going off to war. The names of soldiers in the various battalions would be printed as they enlisted, and as they departed, often even with a photograph (in an era when photographs published in the newspaper was still quite rare). Sadly, the newspapers were also later reporting these same souls in their never-ending lists of injured, missing and killed-in-action Canadians. 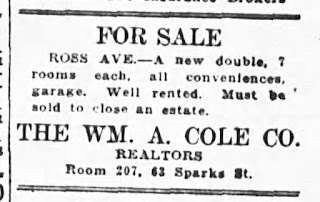 Thomas Cantrill was not one of the original Wellington Village auction buyers, but in May of 1922, the 33-year old civil servant with the Department of Labour acquired one of the Ross Avenue lots with the dream of building his family their first home. Thomas had spent nearly five years in the front lines of WWI as a member of the 1st Canadian Field Ambulance. Soon after returning, he married his girlfriend Ivy and within a year the couple had their first child, Charles in 1920. Thomas built 79 Ross during the summer of 1922, and after completing it, acquired the three neighbouring lots, and built 75 Ross in the fall of 1923. He then sold the original house at 79 Ross and the family moved in to what would become their long-term home, at 75 Ross. 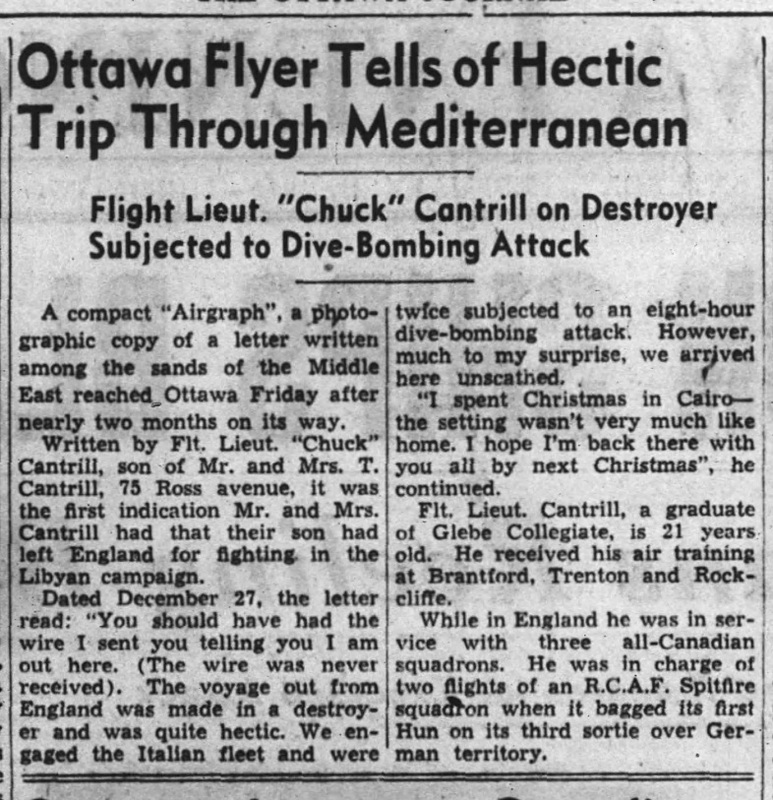 Charles Cantrill, or "Chuck" as he was known to friends, attended Elmdale School as part of the first group of kids when it first opened in 1929, and remained until moving on to Glebe Collegiate. He became one of the neighbourhood's most well-known kids, playing hockey and other sports on the local Ottawa West teams as a teen. At Glebe he was a member of the Capital City Boys' Band which took first prize at the Canadian National Exhibition in 1936 and 1939, and part of the band and orchestra at Glebe, where he played cornet. Just days after the outbreak of war, Charles voluntarily enlisted with the Royal Canadian Air Force on October 9th, 1939. 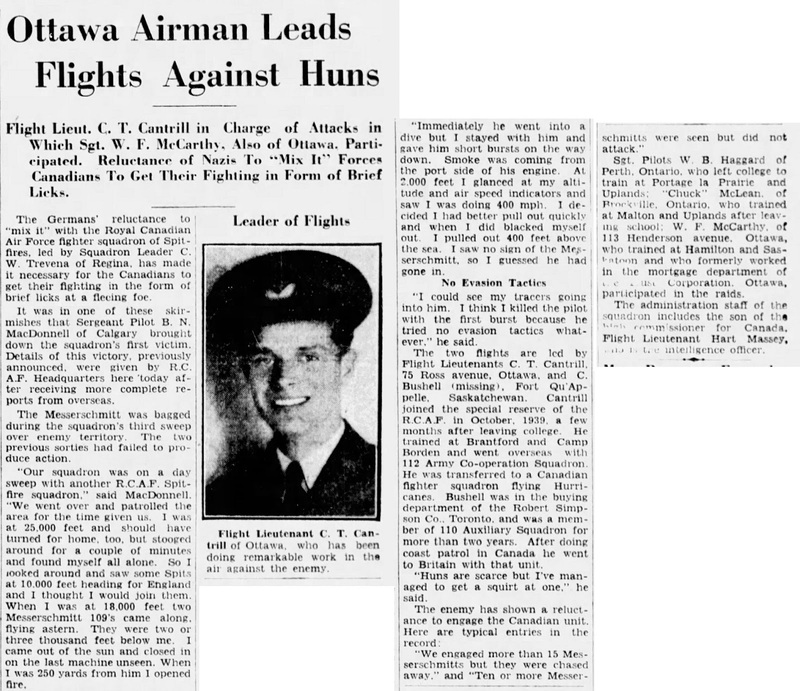 The details of his time in uniform are thanks to the two local Ottawa newspapers, who for whatever reason, followed Charles' progression and experiences in surprising detail in the newspaper, and proudly reported on his heroic efforts overseas. And he certainly accomplished a lot. 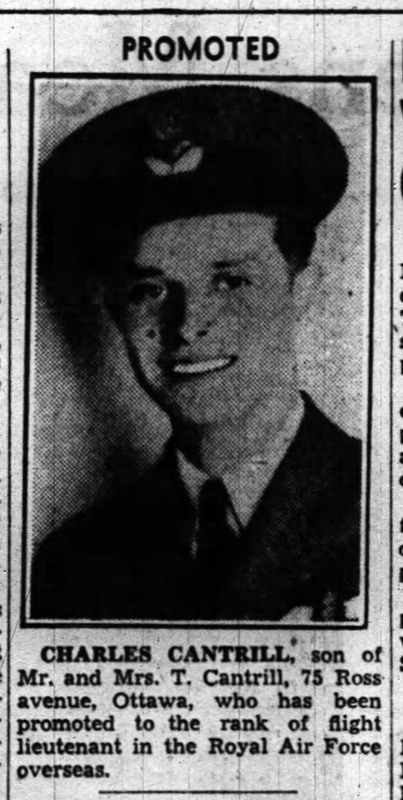 Upon enlisting, he was first posted to Brantford, where he completed his 50-hour flying test in December 1939 at the Brant-Norfolk Aero Club, and later to Camp Borden where he received his wings, and then returned to Rockliffe Air Station in the late summer of 1940. He was then sent overseas as a flying officer in September of 1940 with 112 Army Co-operation Squadron. He was promoted to the rank of flight lieutenant in August of 1941. That November, the newspapers reported that Charles had the rare privilege of speaking with the King of England when his Majesty performed an inspection of Canadian airmen overseas. By that point, Charles was flight commander of "B" Flight Squadron in England, flying Hurricanes. Tragically, this story does not have a happy ending. 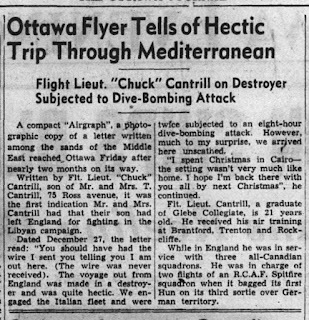 On June 7th, 1942, 22-year old Charles Cantrill was reported missing by the RCAF. He had spent endless days in the air with his unit, and on the fateful day, while flying over Africa, his squadron was surprised by a heavy formation of German planes, and he failed to return to base. His parents were told the news on Monday June 15th, and the newspapers reported the sad update that evening. 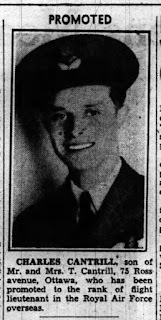 Any hopes that Charles would be miraculously found were lost, and on the RCAF casualty list released on February 16th, 1943, his status was changed to "presumed dead". At the annual year-end Ottawa high school bands demonstration at Glebe in June of 1943, Charles was memorialized as part of an honour roll, which I imagine is still displayed in the school today. Records indicate several other young Ross Avenue residents were part of the Canadian active service during WWII. The McGill family at 89 Ross had three boys in the war, all of whom attended Elmdale School: Gordon, Wilfred and Stewart. 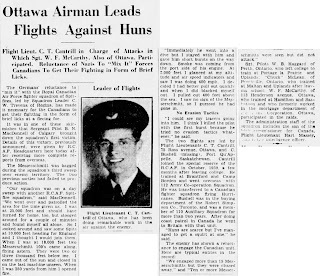 Gordon was a second lieutenant in Brockville, Stewart was Airman First Class in Regina, and Wilfred who attained the rank of Sargeant during his six years overseas in England, Holland and Germany. Wilfred returned to Ottawa in September of 1945 with his English war-bride and two-year-old son John. Lorraine Foley, daughter of one of Ross Avenue's first home-builders James Foley, at 44 Ross, was a member of the Women's Royal Canadian Naval Service. Others include Leading Aircraftsman F. J. Sullivan of 111 Ross Avenue, who arrived overseas in January 1944; Tony Kendall of 88 Ross Avenue, who was in Holland as of March 1945, and appears in the photograph below; and Stuart Kettles of 17 Ross Avenue of the Royal Canadian Naval Volunteer Reserve, also pictured below, who held the rank of Leading Writer, and who had a harrowing experience in the war, having been on the Canadian destroyer HMCS Athabaskan which was torpedoed in the English Channel in 1944, leading to Kettles spending a year in a POW camp. What today is known as Sir Frederick Banting Driveway running through Tunney's Pasture from Scott to almost the Parkway was for a time known as Ross Avenue (as it is a direct continuation of the street). Initially this segment was known as Gainsboro Avenue and was part of the Eldonwood subdivision plan developed in 1909 by the Ottawa Stock Yards and Abbatoir Company. 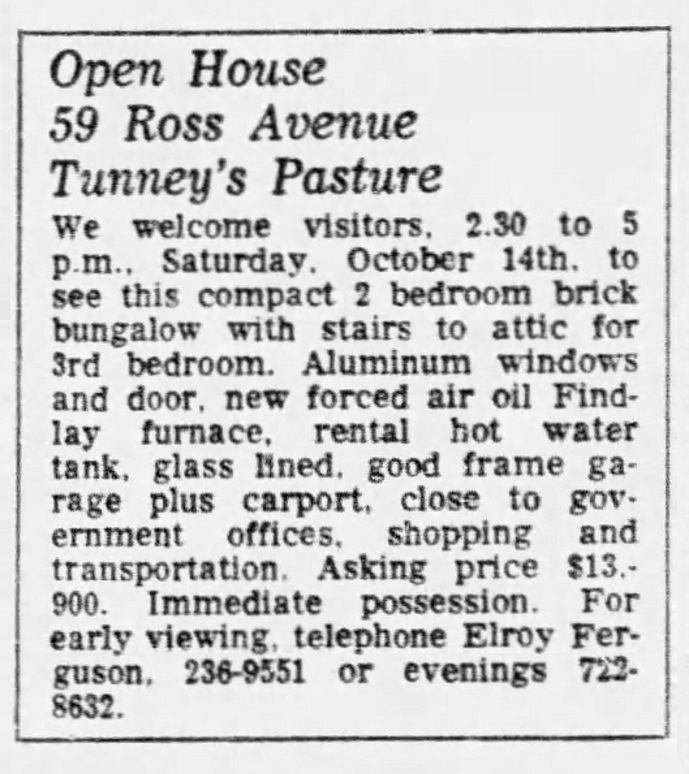 The name was changed in March of 1951 to Ross Avenue (to avoid confusion with Gainsboro in McKellar Park), but ultimately all of the lots on Ross were expropriated for the creation of Tunney's Pasture by the early 1950s. It retained the name Ross Avenue until I think the early 2000s. 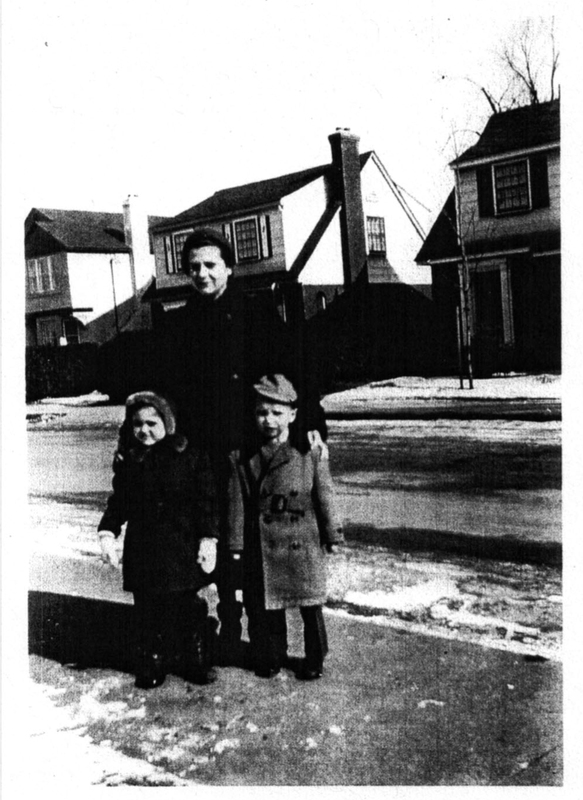 During the late 1940s, the Ross Avenue extension began to become quite a vibrant little street, and even Elmdale Avenue to the east began to see lots sold and houses built. The plan below shows Ross just about at its peak. of Premier Street, which extended more east than it does now. Scott Street and the CPR line are along the left edge. As shown in the plan above, the Quesnel mill is pictured below in this shot of Scott Street looking east from about 1949. Quesnel mill at Ross and Scott, circa 1949. Albert Quesnel was a local contractor who arguably was the busiest home builder in Kitchissippi in the 1940s. He acquired most of the Eldonwood lots from the City just after WWII, established his mill and began building houses along Ross/Gainsboro. This was a challenge however, as there was no water or sewer service to this part of the neighbourhood yet. Primitive wells and outhouses were being used by the early residents. 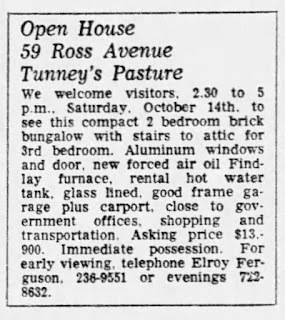 Unfortunately for Quesnel and all the early house buyers, in late 1948, the Federal Government came along and ordered everyone out. 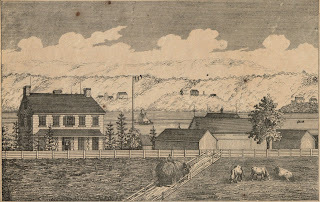 The Tunney's Pasture complex was to be built, and the government required all the land right up to Northwestern Avenue. The new Gainsboro/Ross street along with all of the other lots in the subdivision were expropriated. Owners were paid well for their expropriated property (quite a lot more than they had just paid just months earlier in some cases), but subdivision owner Albert Quesnel was not as pleased, and felt he was only being offered one-fifth of what the land was worth. 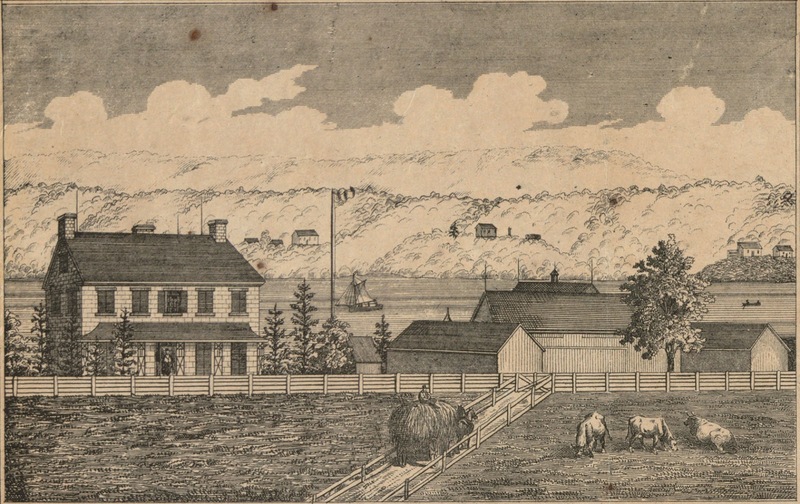 Quesnel had only a brief period of time to both settle with the government, but also move whatever houses he could from the subdivision. Many were moved within the area, particularly to Northwestern Avenue. The entire Eldonwood Park story is one that I will write about in greater detail someday soon! Ross Avenue, as you might expect, has had limited commercial businesses on the street, except for of course, at the corner of Wellington. For several years in the 1950s and 1960s, Patrick H. Moore operated a music studio out of his home at 91 Ross, under the banner of "Willis & Co. Ltd.". Otherwise, all the commercial action was at the top of the street. 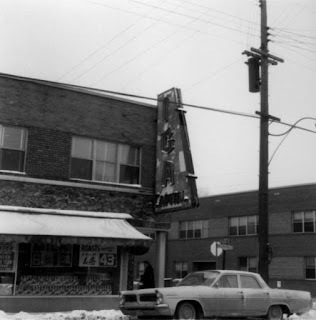 Construction began on June 14th, 1954, on the two-storey building at the north-east corner of Ross and Wellington. The old Driscoll house was removed to make way for the new building, which was originally designed to include a bank (which was leased to the Imperial Bank of Canada), four stores on the ground floor fronting Wellington Street, and six bachelor apartments on the ground floor as well, with 11,000 square feet of office space on the second floor. 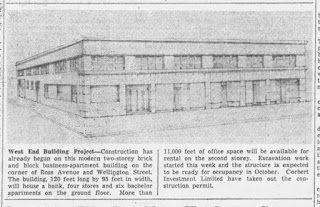 Plans were made by J. Morris Woolfson, architect, and construction completed by Corbert Investments Ltd. It was ready for October 1st, 1954, and was built at a cost of $200,000. It appears the plans for the bachelor apartments was scrapped sometime in July, mid-construction. The first tenants of the stores were the West End Shoe Repair, Western Tire & Auto Supply, H&J Kosher Meat Shop and the Island Park Pharmacy. The following year, the new building on the north-west corner of Ross and Wellington went under construction. This building was also built by Corbert Investments, and in fact for many years the building was known as the "Corbert Building". 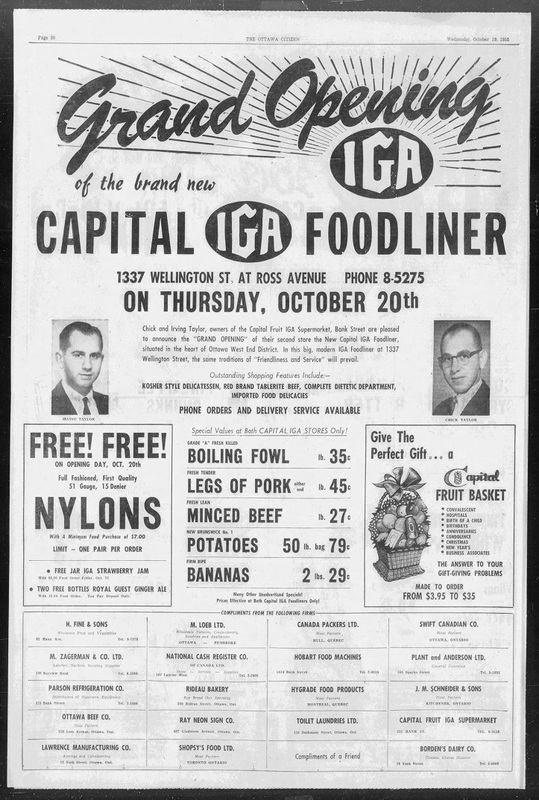 On October 20th, 1955, the new Capital IGA Foodliner opened at 1337 Wellington Street, in the building which is now Capital City Luggage. To lure new customers to the store, the highlight offering on opening day was a free pair of nylons (with a minimum food purchase of $7.00)! The store was opened by Chick and Irving Taylor who already owned the Capital Fruit IGA on Bank Street. 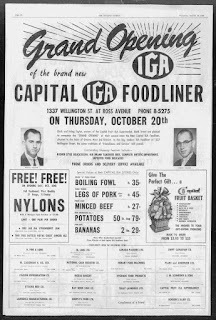 The Ross and Wellington location was one of many being opened by the fast-growing IGA during 1955-1956; they were expanding to the tune of over $2 million, bringing the total number of IGA stores in Ottawa-Hull to over 100. Full page ad announcing the new store. 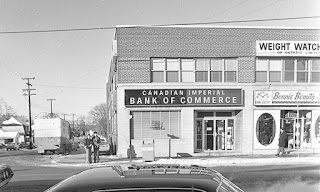 The IGA building had a side entrance that fronted Ross Avenue, and so technically many of the businesses at the rear of the building had (and still have) an address of 120 Ross Avenue. At opening there were four businesses with the 120 Ross address: the Johnstone Insurance Agency, Standard Tube (a steel tubing business), Trans-Canada Credit Corp, and the National Unemployment Insurance Commission Association. Notably, these two buildings at this corner became a key strategic location for the U.S. Government during the height of the cold war. At 119 Ross, behind and above the Imperial Bank, the U.S. Air Force located their Central Co-ordinating Staff of the Canadian Air Defence Command, Detachment No. 1. As well, the U.S. Embassy opened an annex here also, though they soon after expanded and moved across the street to 120 Ross. In May of 1971, the Family Centre for the Deaf opened at 119 Ross Avenue, in space donated by building owner Norman Zagerman. A year later, 119 Ross also became the home of the Family Service Centre, which it remained for thirty years. 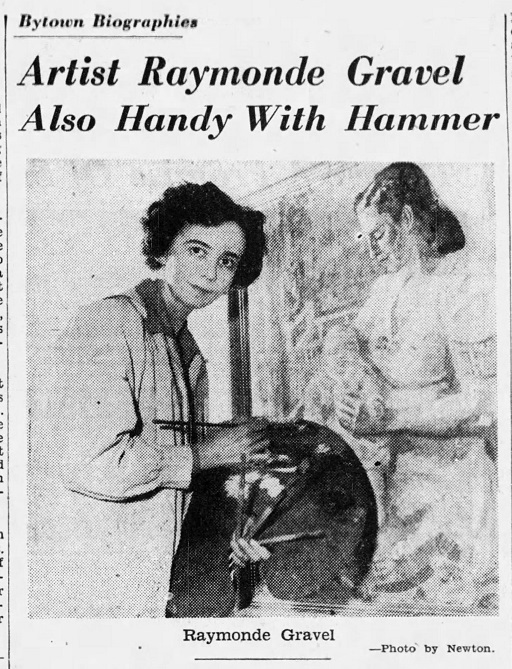 One of Canada's top artists in the 1940s made her home on Ross Avenue. 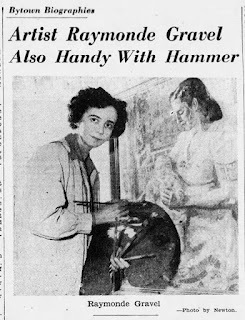 Raymonde Gravel, originally born in Montreal in 1913, spent her childhood in Windsor, before attending John P. Wicker's School of Fine Arts in Detroit as a 15-year old, and the Los School of Fine Arts in New York City at age 17. 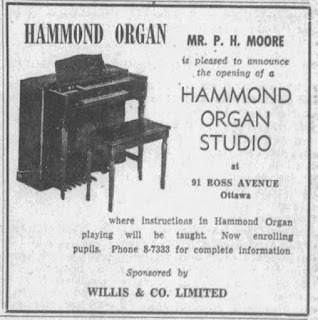 She came to Ottawa to attend the Normal School in 1932-1933. She then spent several years in Paris, studying at the Academie Julian and the Ecole des Beaux-Arts, where she was recognized as one of their most promising students. She began exhibiting her work, at the Salon des Artistes Francais and the Salon d'Automne from 1936 through 1939, and also in the Royal Canadian Academy at Toronto and Montreal and the Art Association in Montreal. She returned to Canada and purchased a farm north of Toronto, until the fall of 1943, when she decided to move back to Ottawa to make her permanent home. She acquired one of the last vacant lots on Ross, at the very north end, and built 11 Ross in 1943. The house was not only for her, her parents and sister to live in, but also for her home studio, where it was reported she had canvases and paintings in every room. She was often part of National Art Gallery exhibits, and was a favourite of the Royal Canadian Academy of Arts. One of her most famous paintings, 'Marie-Rose Turcot' is displayed permanently in the foyer of Ottawa City Hall. One of the most well-known Ross Avenue residents of its early days was Mr. J. P. Nolan, who resided at 38 Ross, and also later 24 Ross in 1941. 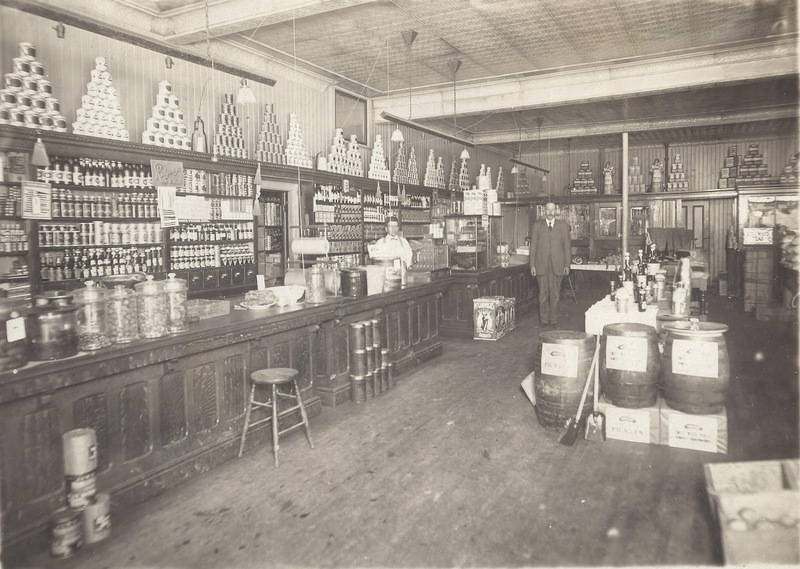 From 1918 onwards, he conducted a grocery store at the corner of Armstrong and Carruthers. 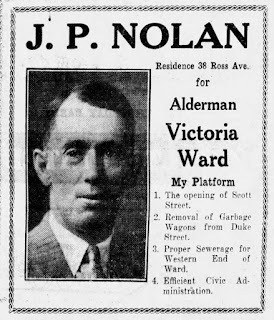 In the winter of 1930-1931 he ran for alderman of Victoria Ward, but was later elected for nine years to City Council between 1935 and 1944. He died in 1968. 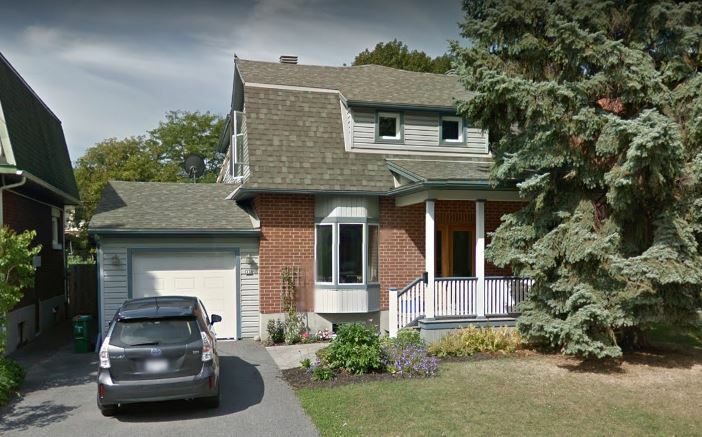 Ernie Calcutt, the voice of the Ottawa Rough Riders from the early 1960's until his death in 1984 spent his teenage years living with his family at 61 Ross. 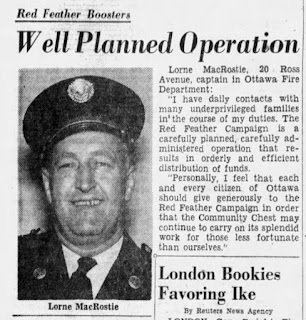 Lorne MacRostie at 20 Ross Avenue was a Captain in the Ottawa Fire Department, and is pictured below. 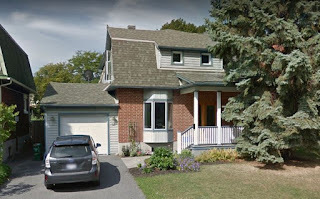 In fact the MacRostie family was on Ross Avenue for 43 years, and deserve special mention for the detailed house and street history that daughter Susan MacRostie Fulford wrote several years ago, for a subsequent owner of 20 Ross. Lorne and Hilda MacRostie built 20 Ross in 1940, according to Susan's report, as "it was a city rule that firemen had to live within the city boundaries. Few people had cars (it was the end of the Great Depression and the beginning of World War 2) and firemen were expected to be on call in the case of a huge fire. At that time, the western edge of the city was two blocks west at Western Ave. Everyone thought my parents were crazy to move 'way out there'." This was a random story about bus bumping that I thought was kind of neat. Apparently a very common thing to do back in the day, and in fact up until the 1970s even; my parents actually met bumping buses in the neighbourhood! After the LeBlanc tragedy in 1927, the next big tragedy to occur on Ross Avenue came on Friday June 19th, 1959, at 5 p.m., when a 2 1/2 year old girl, Linda Campbell, daughter of Hugh D. Campbell of 99 Ross Avenue, was killed instantly when she was hit by a car in front of her house. The little girl ran our from in front of a parked car, and was struck by a car driven by a Northwestern Avenue man, Calvin Pyefinch. Pyefinch rushed the girl to the Civic, but it was too late. Linda was the youngest of eight siblings, who ranged in ages from 2 to 13. The coroner's jury held in January 1960 found that Pyefinch had no chance to avoid hitting her, and that Linda had committed an "impulsive act", running into the road without looking. Witnesses attested that Pyefinch had been going no more than three or four miles an hour, and that it appears the girl had been struck by the fender or headlight. Pyefinch claimed he was travelling particularly slowly as he had noticed "lots of children running up and down the sidewalk", and said in fact that he "seldom used that street - in fact, I usually avoid it if I can." Another tragic event occurred on what an Ottawa Police Sargeant called Ottawa's "blackest ever Friday the 13th", when a man was killed at the Ross-Scott train crossing, just hours after four men were killed at another crossing in Ottawa. 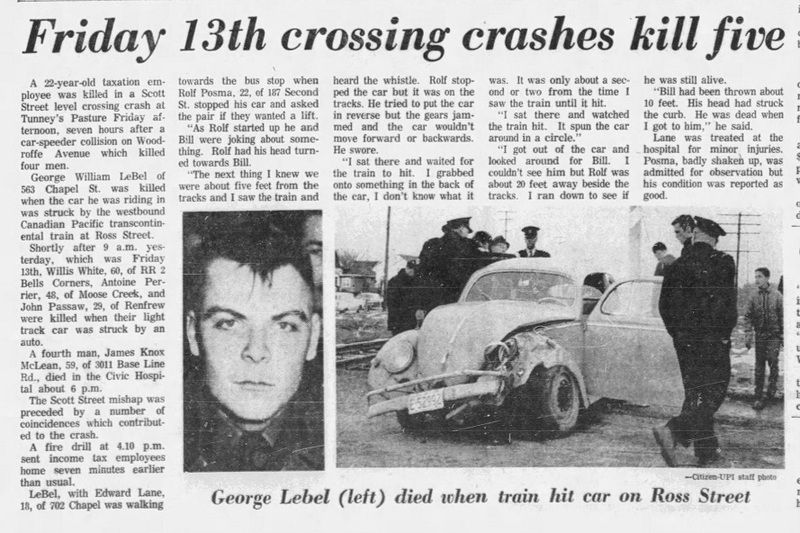 The Ross accident occurred in the afternoon of March 13th, 1964, after what the newspaper called "a number of coincidences which contributed to the crash." A fire drill at 4:10 p.m. sent Revenue Department employees home several minutes earlier than usual. Bill Lebel, just 22-years old and a recent discharge from the Army, had been walking with a colleague towards the bus stop, which typically would require them to walk across the train tracks. Another colleague pulled up and offered them a lift. They were chatting and didn't notice the car was sitting on the tracks just as the CPR's trans-continental train, 'The Canadian' was coming down the tracks. The driver was unable to go forward as rush hour traffic was leaving Tunney's to turn onto Scott. He had inadvertently stopped the car on the tracks, and when he attempted to reverse, discovered the gears had jammed and wouldn't move forward or backwards. The impact spun the car, and two of the men were thrown from the car, including Lebel. The coroner later stated Lebel died of a fractured dislocation of his neck "by being flung from the right-hand front seat of the car." 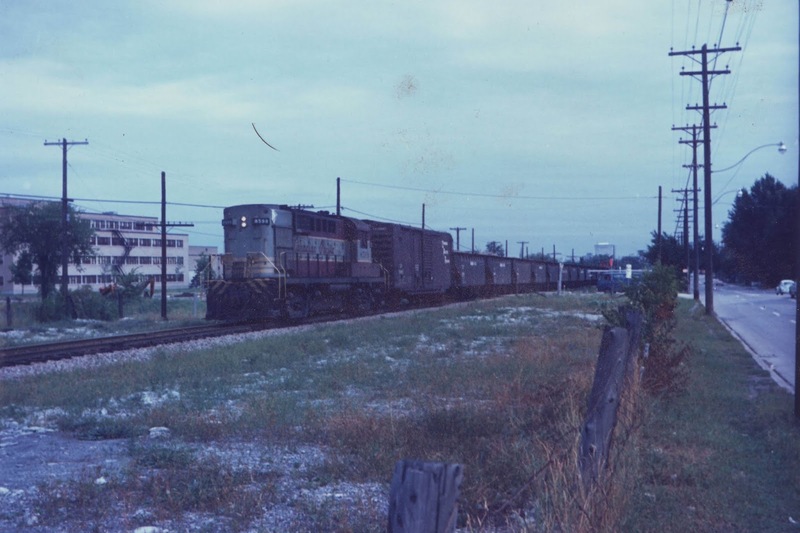 The accident led to significant improvements at not only the Ross Avenue crossing, but the way trains and cars were to interact at crossings in general. Warning systems were added at the Ross and Holland crossings, sidewalks were added for pedestrians, Ross Avenue crossing was widened, train crews were to be instructed to throttle back and slow when traffic across the tracks ahead appears to be busier than usual (which it was, since quitting time was earlier that day owing to the fire alarm), and most of all, the continued education of drivers in watching for trains when approaching tracks, and just as notably, the importance of wearing safety belts in the car, which likely would have saved Lebel's life. 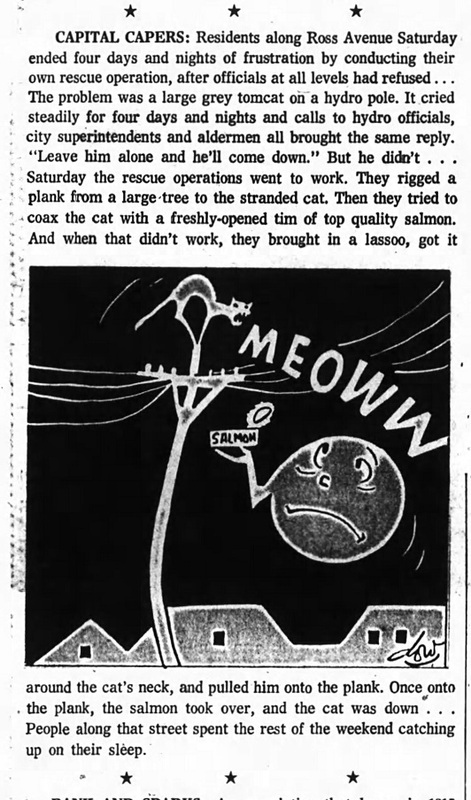 A much lighter moment in Ross Avenue's history was in July of 1973, when a cat became stuck at the top of a hydro pole and refused to come down. 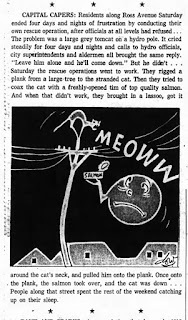 This caused concern for neighbours for four days, until finally hydro officials came in and installed a plank from a large street to the cat, lassoed the cat onto the plank and lured it along with salmon. And one last set of photos to finish the history of Ross Avenue -- oblique aerial shots of the north and south halves of Ross Avenue from 1974. Hope you enjoyed the street history!